Jo Myers-Walker is an artist based in Iowa City, Iowa. She writes, "I have been an artist and art teacher for more than 35 years, working with people of all ages. Although I'm mostly into watercolors at the present time, I'm always exploring new techniques in papermaking, and acrylic sculpture. For me, the most joy of creating something is in the process of dreaming it up and figuring out how to actualize it. I taught at Iowa State University from 2000 to 2004 in Watercolor, Mixed Media, Art Education, and Foundations." About her work: "Often I paint on location or sketch in my sketch book. I am always looking for the story or essence of the subject matter. 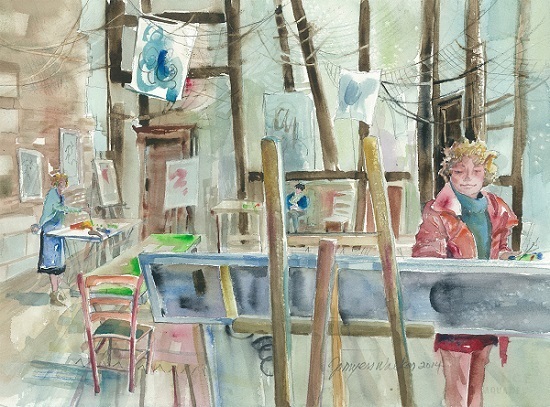 There is usually an 'inward journey' of everyday life captured in flowing and spontaneous watercolor."